The Navy Log was rebuilt on the Acquia Drupal Platform to create a lasting legacy of honor that reaches across generations and tells the story of our Sea Service veterans. In order to help improve the performance of the Navy Log site, Fig Leaf Software migrated the application to the Drupal Content Management System on the Acquia platform. Fig Leaf updated the database, built and implemented a Drupal Custom Module to support the Navy Log to better support public record searches. Get a FREE Drupal Cloud Assessment to see if the Acquia Drupal Cloud Platform is right for you. In order to simplify and improve the overall user experience, Fig Leaf designed a new menu structure and improved the log creation process by adding selective questions to help citizens quickly and easily add new records. The new improved log creation process streamlines production which will result in improved quality and quantity of log data than on the previous version of the site. To secure user privacy, the Fig Leaf creative team implemented a membership option, which permits visitors of the site to create Logs while keeping their personal information private. The team also created an option to submit edits to a Log for review; this feature keeps the Log site updated while maintaining security of the site. 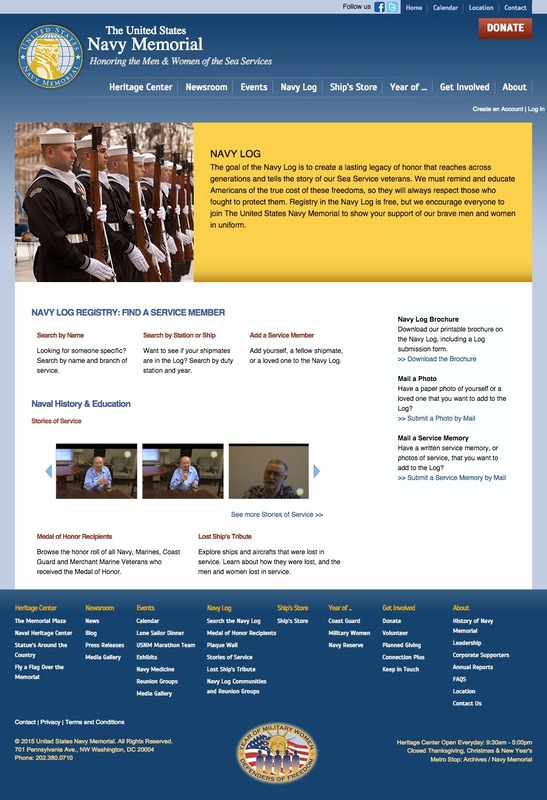 The new accessibility allows the Navy Log to promote a lasting legacy by telling personal stories of sea service veterans, promoting and expanding visibility of the Navy Memorial, and providing educational value to its users. The updated features provided by Fig Leaf have enabled site viewers to locate information easily as well as virtually visit the Navy Memorial. Visitors and members of the website can quickly search for historical details and locate information on the plaque wall. Fig Leaf’s solution included a kiosk capability to allow visitors to the U.S. Navy Memorial to search the Navy Log and add content while visiting the physical location in Washington, DC.